This past weekend, weeks of planning culminated in "Date Night," an evening dedicated to serving married couples in our church and community and giving them an opportunity to have fun together and celebrate marriage, years after the wedding. I first proposed the idea back in February. In conjunction with the UN's International Day of Families, which occurred on May 15, many groups throughout this country are organizing events with the purpose of supporting, educating, and celebrating families in a myriad of ways. Because sometimes it might appear that marriage isn't celebrated all that much post-wedding and other than milestone anniversaries, I thought that I could add a small part to this month of celebrating families by organizing a "Date Night" with the help of a group of teenage volunteers. This was the most intimidating event I've put together. I've never thrown a party in a venue I wasn't familiar with, and found that to be pretty challenging. On the day of, when we were facing sinks that didn't work and hot plates that didn't heat our pots...I discovered that there is a reason behind why I'm intimidated by unfamiliar venues. But it was a truly beautiful location, one that I think the couples who attended really appreciated! 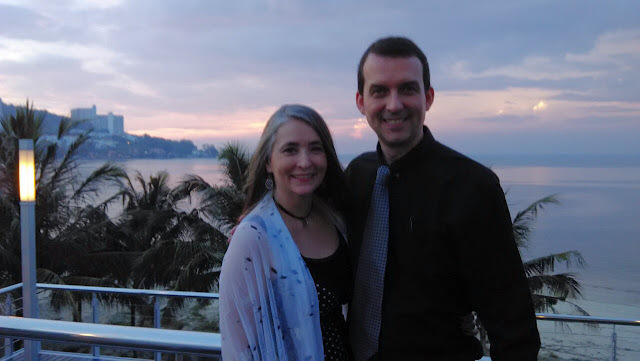 This was Date Night on a budget--we charged a nominal fee, but kept the cost low (around $8 USD per couple) because I didn't want anyone to be excluded because of the cost. Inexpensive tables were rented and to disguise the not-too-pretty surface we wrapped the tabletops in brown paper. Each table was set with flowers and candles--we raided my mom's china stash for enough bowls to float tea candles and flowers in. Each table also had a little cup of homemade trail mix for snacking on, as well as a score cards and two sets of men and women on sticks for a game we'd play during the evening. We decorated one wall for a photobooth, and couples got a polaroid photo taken of them when they walked in as a souvenir to keep. After that, some couples sneaked out through the kitchen to take photos by the water--when it was time to start the dinner, I had to come looking for everybody since they were still outside by the sea. My parents were one of the 15 couples in attendance at the event. We had 16 children under the age of 10 in childcare (capable Anna was in charge of that half of the event), and the majority of our servers were between 10-18, and they did an amazing job in the kitchen, creatively plating all of our homemade food. During each course, we turned on the instrumental music in the background, dimmed the lights a little, and gave the couples time to enjoy eating and talking at their own individual tables. Between each course, however, things became even more exciting! After the salad course, we determined who was the longest-married couple in the room (38 years!) and who was the shortest-married couple in the room (6 years!). Technically Angel was taking photos in the room and I was the MC, so we would have won with our mere 5 years of marriage...but we weren't actually attending the event. :) The longest and shortest married couples won vouchers to go on a coffee or ice cream date at a local restaurant. After the soup course, we used the stick men and women to play the game where you get a point as long as your answer is the same as your spouse's answer. For example, if I ask, "Who is the better driver?" and you both hold up the man on a stick, you get a point. If you disagree and one holds up the woman while the other holds up the man, no point. It's the classic "Shoe Game" from weddings, only without shoes--because who wants to hold on to their shoes around food? Two couples tied for first place, because their answers matched on every single question. After the main course, we had a "Name That Famous Couple" game, where they raced to write on the whiteboard the names of well-known couples while I read out clues. The one they had the hardest time with was "I was a smuggler and she was a princess. There was that other guy, too, but he was out of the running once we found out he was her twin brother. We had a son, but he went to the dark side." I guess we didn't have a lot of Star Wars fans in the room! Winners of that competition received movie ticket vouchers to go on a movie date. The kids also got a meal, but nothing nearly as elaborate--hot dogs and watermelon and biscuits seemed to hit the spot just right for the little ones. We brought a toybox from home, and materials for a "make your own monster" craft that was a big hit, and Anna kept the whole crew occupied throughout the evening. I was so proud of everyone that pitched in to help with this event, it was a lot of fun to be a part of. My blue hair was looking gorgeous that night, if I do say so myself, so I wish I had a good photo or that Angel and I had stopped by the photobooth...but that is the difference between hosting date night and attending. :) 'Twas a grand adventure. The sign they made reads "Date Night 2016"....we may very well have to cook up a 2017 edition. Such a fun idea!! I'm sure everyone appreciated all the hard work you put in! Aw!!! So cool that you dedicated your time for such a great cause. I love how you incorporated games! My friend did the shoe game at her wedding and it was a hoot. Rachel, it's so cool that you put this together!!!! I love it. Some churches in our area have done date nights before (I haven't been, yet, since I haven't been around one since I actually got married! ), and I think that this whole concept is an awesome way to support married couples. I also think it's really cool how you did it "on a budget" because that involves so much creativity and makes it affordable! Haha oh my, hearing about your shopping adventures for this venture makes me so grateful that I live within a 10 minute drive of both Target and Walmart :P Thanks for the reminder to not take those kinds of things for granted! Name that famous couple sounds so fun, I love trivia type games like that! What a great idea! And impressive! I would've attended in a heartbeat if I could. Looks to me like you did a pretty amazing job! I can't even being to fathom setting something like that up, and I can only imagine how much planning and cost-savvy shopping had to go into this. 38 years of marriage is amazing for that couple! I'm sure everyone appreciated this so much! What a fun idea! Looks great! Celebrating love is the best thing to do in live! Would love to attend as well one day haha! Oh my gosh! This is such an awesome idea! I love that you celebrated marriage on just a "regular day". This would be such a fun party to throw for friends! this is so great - what a beautiful venue indeed! congratulations on pulling it all together in an unknown venue and providing a great night for many couples! Wow! Impressive! This sounds like lots of fun and so well organized. I know how difficult it can be planning for a large event and trying to source ingredients or materials. I had Thanksgiving for 20 at my 1 bedroom apartment when living in France. Like you wrote, it was an adventure! Sounds like a fun night. It's been a long time since Phillip and I have eaten a meal together that we didn't have to make or share with several small people! I'm way behind but what a great event to host! You did a wonderful job and it sounded like a great time!